Foothill-Sierra Pest Control offers a variety of residential pest control solutions to fit individual needs and pest problems. Our expert staff is continually trained in the latest methods and techniques for controlling pests. Our year-round treatment plans are 100% guaranteed. Each visit begins with a thorough inspection of your home and yard to identify potential pest harboring sites and entry points, and the appropriate treatment is then chosen to solve current problems and prevent future pest invasions. Quarterly Service: Quarterly pest control is our most popular service and features four complete visits each year, once every quarter, and is fully guaranteed. 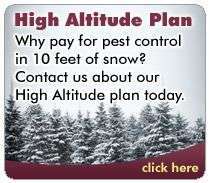 High Altitude Service: This service is for our customers in the higher elevations who get more snow during the winter months. For these customers we come every other month in the spring, summer, and fall, skipping the winter months. This service is also fully guaranteed year-round. Green IPM: We have Eco-Wise Certified Practitioners on staff that specializes in a natural approach to common pest problems. Often times with little or no chemicals involved, we can solve typical invaders such as ants, spiders, and mice. Single Service: A one-time visit is offered for those customers wanting treatment without a year-round contract agreement. The single service has a guarantee of 30 days.